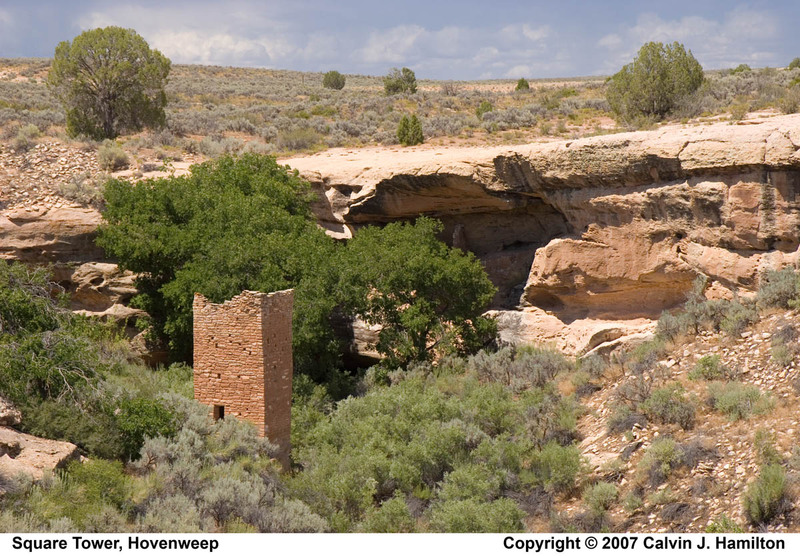 The Square Tower Group contains the largest collection of ancestral Puebloan structures at Hovenweep. The remains of nearly thirty kivas (Puebloan ceremonial structures) have been discovered on the slopes of Little Ruin Canyon, and a variety of other structures are perched on the canyon rims, balanced on boulders and tucked under ledges. It's possible that as many as 500 people occupied the Square Tower area between A.D. 1200 and 1300. Square Tower, for which the group is named, is a three-story tower built on a boulder at the head of Little Ruin Canyon. A nearby spring would have been an important resource for the inhabitants of Hovenweep. To increase water storage, a checkdam was built above the spring in order to slow storm runoff. The unique location and appearance of Square Tower fuels speculation that it was a ceremonial structure. Located near the visitor center and campground, the Square Tower Group is the only unit of Hovenweep accessible by a paved road. A moderately strenuous trail follows the canyon rim and offers excellent views of every structure. Most visitors spend one to two hours exploring the area. Between the visitor center and the first overlook the trail is paved and may be traversed by visitors in wheelchairs with assistance.